Two Kings is the organizer of the Real Estate & Blockchain Meetup group. Two Kings recently held the first meeting of its kind in New York City and will continue to organize events from time to time as the technology and industry develops. We believe blockchain and cryptocurrencies will be transformative for real estate and real estate processes. We look forward to facilitating cutting edge discussions and development of these changes. 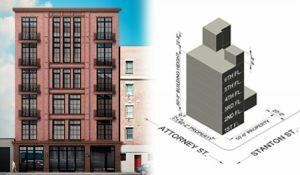 Two Kings Company announces the closing of its purchase of 148-150 Attorney Street, a development site that once played an integral part of Manhattan’s historic and trendy Lower East Side. The company will build an exclusive 6-story residential condo building to capture demand for apartments in one of New York City’s most popular neighborhoods. New developments and attractions such as Essex Crossing and the Lowline add to the ongoing transformation of an area largely known for its vibrant nightlife and music scene. The property was originally part of the 300-plus acre DeLancey Estate in the 1700s. Most recently the site was home to the legendary Sin-é night club, a landmark music venue that served as a gateway for a number of celebrity artists early in their careers. Construction of the project is expected to begin this year and be completed in 2018. Two Kings continues to actively seek opportunistic acquisitions, including development sites with approved plans and bulk purchases of condo units. For more information, please contact us at info@twokingsrealestate.com. Two Kings closed on the sale of 220 Davidson Avenue, a 160,000 sq ft office building in Somerset, New Jersey. The company undertook strategic leasing initiatives to dramatically increase occupancy and net operating income despite declining office demand in the broader NJ market. The Class A building included a full-service café and a fitness center with a range of amenities.